An artistic design for the hallway was commissioned in the context of the spatial and optical remodeling of the production complex 6+7; it consisted in the development of a wall painting for the approximately 24 meter-long wall surface, which is interrupted by doors. 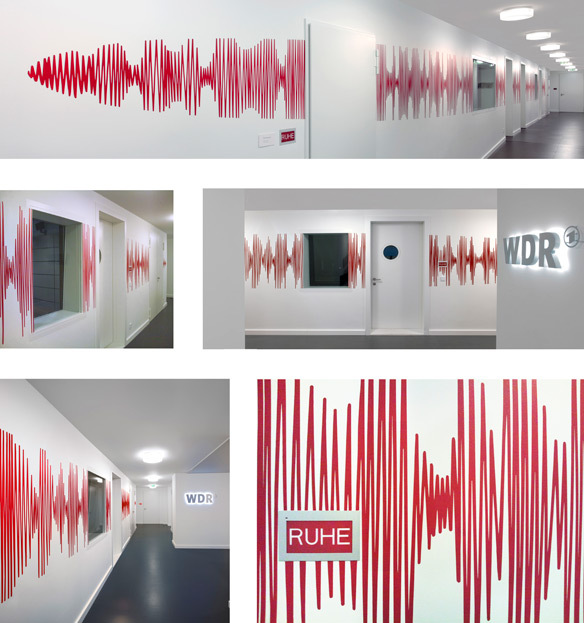 The core idea of the design for the hallway was to visualize the function of the sound studios located behind the wall of the hallway in which basically all the acoustics – the audio-drama is produced. In the form of artistically created, fine-particle frequency movement, sound is transported from the interior space into the hallway. The architecture of the hallway is long and extremely narrow. In order to correspond visually to this circumstance, the concept of a large tranquil form stretching the entire length of the hallway was developed. Corresponding to variations in sound level and intensity the elongated oval represents an ideally balanced and expressive form. The voluminous drawing erases the heterogeneous nature of the wall surfaces, disrupted as they are by doors and connects each end of the hall optically. Since the narrowness of the hallway dictates that the wall surfaces are always perceived in foreshortened perspective, the appearance of movement within the form is absolutely necessary. As one proceeds along the hallway, at certain points the oval appears to take on a different shape as the concentration and distribution of the lines changes and the character of each section of the wall thereby graphically depicts variations in the “sound” of the hallway.